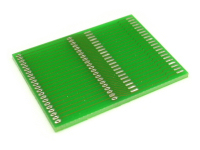 Sideways shifted interconnect-PCBs enables You, to place the device higher and sideways. The PCBs are drilled, through contacted and solder plated. The layout is the same as PSOP44 device, the drill-distance is 15,84mm, the shifting is 20mm.